Half way through the week. That means that my husband only has two, yes TWO more days left of work before he's off for three whole weeks!! I am very excited.....actually we are all very excited to have him home, especially since the kids will be home for two of those three weeks from school. 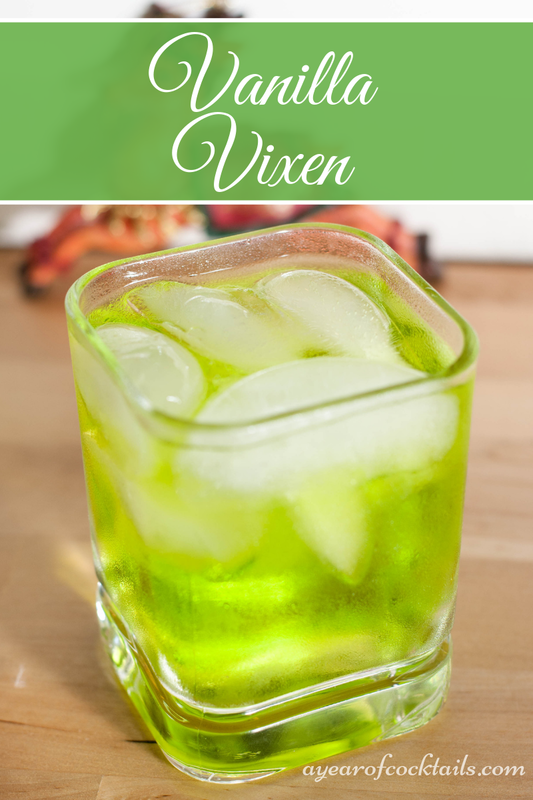 Vixen must be a strong reindeer, because this cocktail packs a punch. I would first off change the name to Citrus Vixen.....although it doesn't quite roll off the tongue like vanilla vixen. This cocktail is quite alcoholy, I can totally taste the citrus vodka and if I think real hard, squint my eyes and tilt my head to the left, I can taste the Midori too. The vanilla vixen was worth a shot....plus it's been a while since I've made a green cocktail. In a shaker, add ice and all of the ingredients above. Shake and strain into a cocktail glass filled with ice. Here's to day 301! Wait.........I've tried Three Hundred and One different cocktails?!?! Holy Moley! !